One of my favorite restaurants in Memphis, Fuel Café, serves a vegetarian meatloaf that is so good that I have to get it every time I go. I just love a fresh update to old-fashioned comfort food like that. So, I decided to take a stab at making my own version of this 1980's-time-capsule treat. As some of you could've guessed, my meatloaf features mushrooms. I just can't get enough of their meaty texture and savory flavor. But I didn't stop there -- I also added tempeh and walnuts for their flavor and hearty texture. This loaf is tender and delicious, especially served over my garlic mashed potatoes and topped with a parsley and tomato salad. This can easily feed a crowd, so it might be something good to make for Christmas dinner. In the unlikely event of leftovers, there's nothing better than a few slices of vegetarian meatloaf dressed with mashed potatoes and cheddar cheese between two slices of sourdough bread. Preheat oven to 350 degrees. Melt butter in a 12-inch skillet over medium-high heat. Add the onion, celery, and carrot to the pan and stir. Cook until onion is translucent and beginning to brown (about 10 minutes). Add the bouillon cubes and stir into the vegetable mixture until incorporated. Place mixture into a large mixing bowl. Add the mushroom, bell pepper, tempeh, sun-dried tomatoes, walnuts, ketchup, mustard, bread crumbs, eggs, garlic powder, red pepper, thyme, paprika, and half and half. Work the mixture together with your hands until everything is well incorporated. Allow mixture to rest in the fridge for 10 minutes. On a silpat-lined, rimmed baking sheet, place the mixture in the center. Using your hands, form a loaf that is about 12 inches long, 6 inches wide, and about 2 1/2 inches tall. The loaf should be smooth and have rounded edges. This will help the loaf stay together when serving. Place loaf in the oven for 25 minutes. 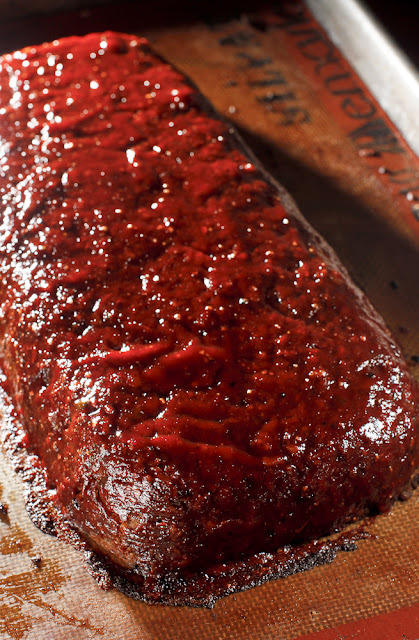 Brush with the ketchup glaze and return loaf to the oven for another 10 minutes, brush another coat of glaze on top, and bake for a final 10 minutes. Mix ketchup, soy, tabasco, black pepper, and sorghum until well incorporated. Toss tomato, parsley, shallot, salt, pepper, sugar, and vinegar together in a small bowl. Place potatoes, cauliflower, butter, half and half, garlic, salt, and pepper in a covered, microwave-safe dish. Microwave on high for 12 minutes. Mash with a potato masher and then add the sour cream. I'll definitely be trying this one! Looks fantastic. I've never seen a veggie roast look so yummy. Thanks for this recipe. I'm sure it will be the best I've ever eaten. This looks great. I miss meatloaf. 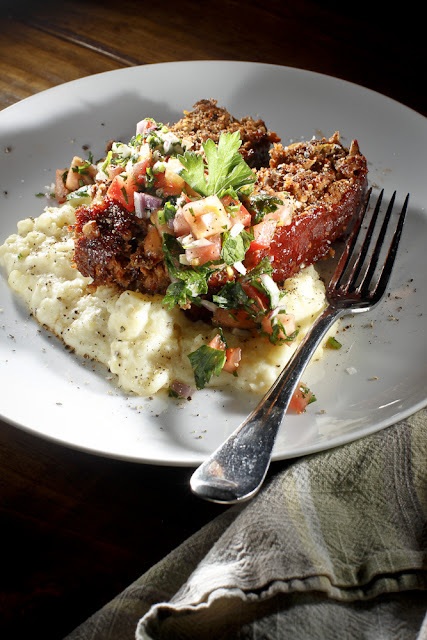 Great idea, throwing sun dried tomatoes into the meatloaf. Looks yummy! If not into tempeh, or want an easy find, one can use dry cottage cheese (drain off the moisture), as a replacement. I have found cottage cheese handy in many recipes that call for ground meats. If one is wanting a gluten free meatless loaf, try replacing the bread crumbs with gluten-free corn flakes. It would serve 8 as part of a meal, I think, if you've got a salad or something else like that. About a dozen slices from this recipe. Instead of sorghum, try maple syrup! We don't have an index, but you can search recipes on the site at the top right corner. Let us know how your meal turns out -- we feel so honored for this to be your holiday dinner!! The results are in - everyone said the meatloaf was delicious! Even the staunchest carnivores were talking about it. I ended up using molasses in place of the sorghum and the glaze was perfect. Our first year hosting Christmas Eve and the food was a hit. Thank you so much. I can't wait to try another recipe from your site. wow. yum. i'll make this tomorrow. Just made this last night and it turned out really good! I used cottage cheese instead of tempeh and my only complaint is it didn't stay together that well when I was slicing it, but it seems to be holding up much better today. Next time time I might make it the night before because it's even better today! Wow, I've been looking for a great meatloaf recipe for a while now! Definitely one of the comfort foods that I miss since going veggie. I also really miss stuffed cabbage! I found this really great recipe for them in Health On Your Plate.. it also features mushrooms. Thanks for the great recipe! I tried this recipe last night, and it's a winner! The texture of the "meatloaf" is perfect. Soft with slight crunchiness from the vegetables and walnuts. The loaf also remained intact. And, the glaze really made it all come together nicely. Thank you for providing such an excellent recipe. I haven't tried it yet, but will have to soon. I just wanted to post how much I love that your recipe is gluten free! It is so, so hard to find vegetarian meat substitutes that are also ok for my celiac son (and taste good). Thanks, Carrie! Let us know how it goes. We really like the little salad on top. We're fairly new vegetarians (just a few months) and my husband, while really wanting to be healthier, has had an especially hard time adjusting coming from a meat and potatoes southern Mama. Last night he was craving his mom's meatloaf (a big comfort food for him) and nothing else would do. I've tried a couple of other vegetarian meatloaf recipes, but none that we cared for. I jumped online and quickly found this one. I didn't have some of the ingredients on hand so I used a couple of substitutes and left a thing or two out, but it was a hit! I made it again tonight at his request. Thank you for inspiring a new family favorite that even pleases the picky hubby! I love this recipe. I really can't wait to try it! I've been craving meatloaf lately and this is perfect! I just wish your recipes had a "print" button to make it easier. Fantastic Thanksgiving dinner! We have tried sooooo many of your recipes and all are keepers! No adjustments, no ...never make that again... Wonderful creativity! Thank you for many enjoyable family eves going over the details of 'how was that made?' Kep the savories coming! So glad y'all enjoyed it! We've only ever made it this way, but it may be a little mushy without the tempeh and the nuts. Maybe one of the veggie burgers dressed in a similar way as the meatloaf? I have made this a few times and it is 99% perfection. do you have any tips for keeping it together? I don’t use a food processor so things might be chopped too big if that matters. thanks. I recommend this to everyone, especially new vegetarians. a smaller chop will help keep things together, but it is a soft, moist "meatloaf." You still have to be gentle with it. I'm so glad you love it. I hope you've checked out our book, The Southern Vegetarian. It's chock full of awesome recipes. Could I use mashed-up chick peas instead of tempeh? I've no East-Asian grocers nearby. I've never tried it, but I'd bet that it would work! Give it a shot. What kind of mushrooms did you use? it's look yummy n delicious. thanks for the recipe. i'll try it soon. These recipes produced a guest and restaurant quality meal. My family loved it. I'll be making and serving this again. This looks terrific. I want to make it for my son when he visits. He's vegan. Can you suggest a substitute for the eggs that won't change the flavor/texture of the "meat" too much? Thanks! Made this for Thanksgiving, 2015! Lovely! A few cooking notes to share: I split the mixture into 2 loaf pans lined with parchment paper. I made a narrow strip along bottom and then another across the loaf pan. This made it easy to lift out and helped keep the shape of the loaf together. I followed the same baking directions and it turned out well. Next time, I will process the vegetable, nut, tempeh, and sundried tomatoes in the food processor as this was the most labor intensive step. I prepped all the ingredients 1 day ahead of time and assembled on Thanksgiving day. You guys are spot on with flavor. I really love your cookbook.